DVD artwork is an important component to marketing and selling your video production. Without the right cover image in place to catch their eye, what customer would pick up your video off the shelf? As such, you need to hire the right graphic designer to bring your vision to life. I have been in business since 1999, creating DVD and VHS covers for such companies as Kentucky educational media powerhouse NIMCO. While many producers are focusing their efforts on digital content, there is no excuse to skimp on your print packaging. There is still a strong segment of customers who collect physical media, and you need to cater to them! Scroll down in order to see samples of my DVD artwork design work below. Then contact me to get started. I’m ready to create the perfect video layout for your graphic design project! My longtime friends Zack and Sarah became husband and wife in June of 2018. The Star Wars themed ceremony took place in a park which was located in nearby Wilmore, Kentucky. I was one of the groomsmen. My three year old son was also in the wedding party performing the duties of the ring bearer. My friends had not hired anyone to film the wedding. Therefore, I volunteered to set my Zoom camera up at the altar. Then, I edited the video in iMovie, including adding the requisite “scrolling text” popularized by the film series. All I needed to do after that was to make the wedding DVD art. 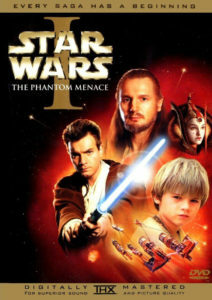 Original “Star Wars Episode 1: The Phantom Menace” artwork, which I based the wedding DVD art on. I loosely based the design on the artwork for Star Wars Episode 1: The Phantom Menace. Critics and fans alike agree this is the worst film in the series. However, of all of the DVD layouts I found online, it stood out for this project. From the montage of the characters floating in space to the golden to the embossed title lettering, the design had the space epic feel I wanted to get across for this piece. The logo featured in the top left of the cover is a recreation I made of the one from the couple’s wedding invitations. Since I had already recycled my copy of the printed invitation, I recreated the mark in Adobe Illustrator. The groom’s mother kindly sent me a photo she took of hers. I set the text in the requisite “Star Jedi” font for the main title image. Afterward, I tilted it using the shear tool, in order to simulate the angle of the original mark they used. Then, I imported it into Adobe Photoshop. This way, I could add the gradient and embossing effects needed to complete the title’s finishing touches. Melissa Rossini, the wedding’s photographer, sent me a few stills from the event for me to incorporate. I created a montage of the wedding party that was similar to the original cover. The bride, groom, flower girl, and ring bearer loom over the light saber fight candid shot below. I overlaid some paint filters and added contrast to each person’s image to simulate the lighting and color effects of the original art. When I was editing the “fight scene” photo, I added a glow effect to the toy light sabers in order to add authenticity. I then faded each of the figures into the red “explosion” over the outer space background. Said explosion consists of a few powder and light burst stock images. I added blur filters to both of them, then recolored them with a bright red to orange gradient. The classic Bank Gothic font spells out the text of the wedding’s tagline “The Saga Continues…”. It also denotes the wedding ceremony’s date, as well as its location. I spread out the letters’ tracking in much the same way the top and bottom text of the original is. Finally, the requisite “DVD video” logo adorns the cover. For the back cover image, I transcribed the couple’s wedding vows from the video, since this was a surprise. I set the text in the venerable ITC Franklin Gothic. It is the same font which is used in the Star Wars films’ iconic scrolling text intros. The perfect shot of the minister and the happy couple during the ceremony provides the backdrop behind the fading black text background. Finally, I topped off the vows with the famous Star Wars logos signifying the Rebel Alliance and the Empire. This was a pro bono design that I made as a gift for my friends, as well as a parody of a well known film series. Therefore, I saw fit to go all the way with the Star Wars thematic elements. Unlike most wedding DVD art covers, it makes a great conversation piece for visitors who see the media shelf in their humble home. The added personal touch of editing the video with Star Wars graphics and music also makes for more replay value than most couples’ wedding videos. I also included two opening and closing slideshows of wedding photos set to the song used for Sarah’s bridal march. The happy couple absolutely loved it. All things considered, this project developed into one of my all time favorites. Will you and your sweetheart tie the knot soon? I know from my own experience how stressful it can be for a couple to keep up with all of the details as they plan for their big day. There are a variety of important elements that the bride and groom must consider. Everything from the catering to the flowers go into making the perfect wedding ceremony. It is so important to make sure that you have your ceremony documented by professional photography and video services. 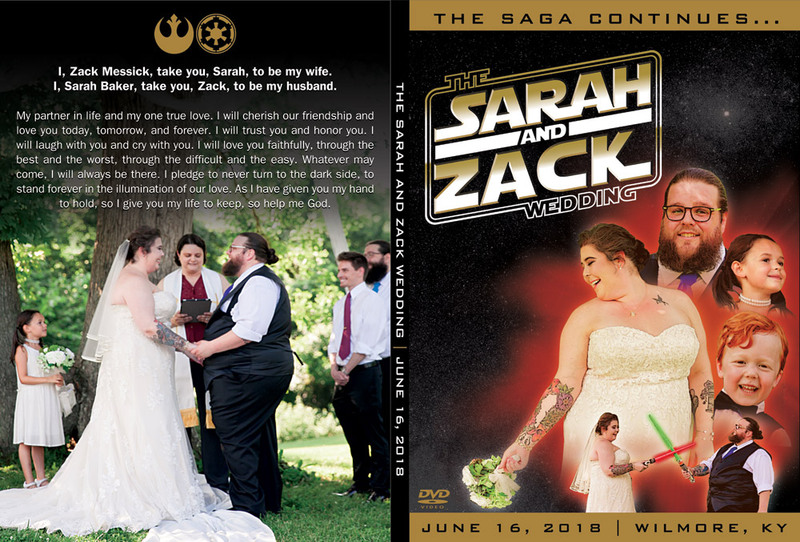 Why not complete your wedding DVD with an equally professional cover art? Even if your ceremony features an unconventional theme, I am the perfect choice to design your wedding artwork. 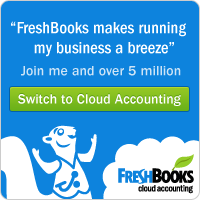 Contact me today so we can get started right away!